In 1984, Nevin Kleege conceived, designed, and built his first "plank and ply" stage, resulting in the birth of Kleege Industries, Inc. Since then, Kleege Industries has striven to remain ahead of the curve of performance stage technological development. Kleege Industries was one of the initial companies in the United States to capitalize on the quantum leap hydraulic technology made available to the live entertainment industry. They now have a fleet of mobile stages that traverse North America every year. Kleege Industries' latest project is proof that their creative ingenuity continues to pioneer the industry. Over the past 8 years, Sustainable Waves has revealed itself to be a trailblazer in the alternative energy production field. Sustainable Waves, as the name itself alludes, specializes in developing equipment that transforms abundant, natural energy sources into sustainable energy solutions for the entertainment industry. By creating solar powered stages, sound systems, lighting, and a variety of conscious products and consulting services, Sustainable Waves allows event and festival producers to stay in line with their patrons' principles and values. The collaboration of these two innovators has manifested as the first of the cutting edge Helios Stages. 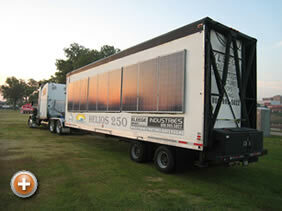 The Helios 250 is a state of the art 32' x 24' solar hybrid stage designed to take the summer concert season by storm. It houses a 4.83 Kilowatt (4830 Watts) solar array, which supplies sunlight to 2 800 amp batteries. They array powers 4 Outback System Inverters that pump 120 amps of power at 120 volts. The stage also houses a 10 KW biodiesel generator equipped with an auto start feature, making the Helios 250 100% self-sufficient. 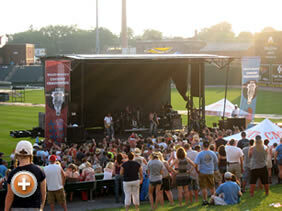 Because the stage stores the sun's energy into batteries, the show goes on, rain or shine, day or night. 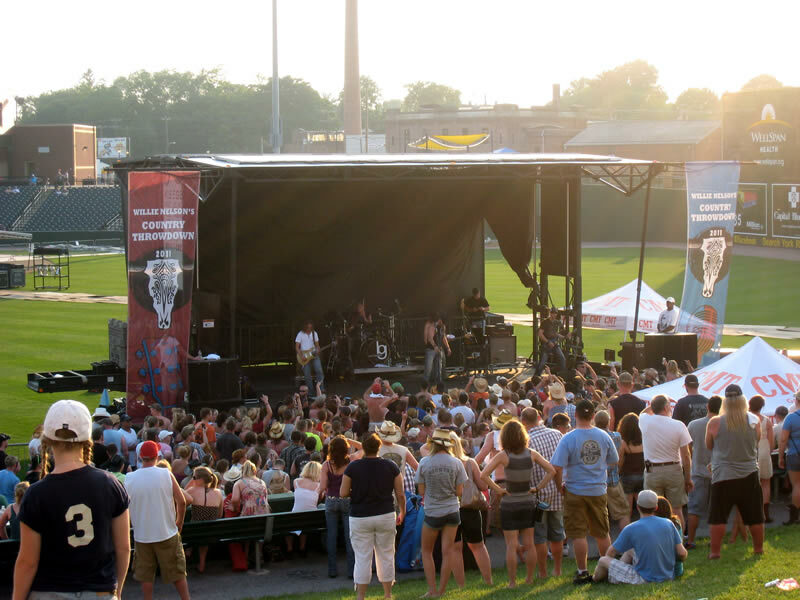 Thanks to visionary tour producers like Kevin Lyman, concert-goers will be able to enjoy the brilliance of our new solar powered stage on the upcoming Country Throwdown and Vans Warped Tours. 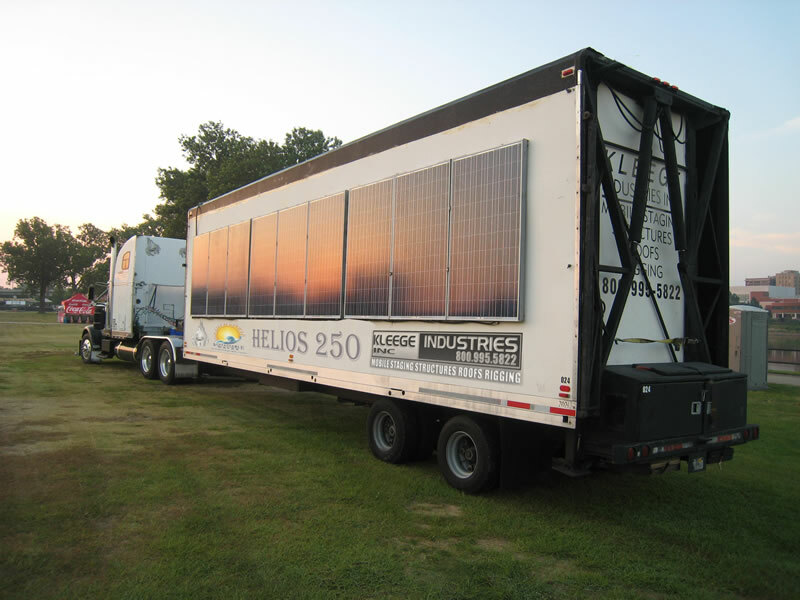 By using solar power rather than a diesel generator or grid power, the Helios 250 avoids emitting approximately 1,000 pounds of carbon dioxide into the atmosphere per event day. That amount is equivalent to not driving 1,100 miles in a car, or the annual sequestration of 66 trees. The two tours combined total of 66 event days. By using the Helios 250 rather than the alternatives, we prevent the emission of approximately 66,000 pounds of carbon dioxide into the atmosphere, the equivalent of 67,100 miles not driven in a car or the annual carbon sequestration of 4,026 trees! With the successful operation of our Helios 250 Solar Unit, we will again be setting the bar for advancement in the industry, raising the standard of energy efficiency in the entertainment production industry. In the words of Kevin Lyman, "Kleege and Sustainable Waves' Helios 250 Solar Stage has taken the use of solar technology to a whole new level and could be the standard for the future... we have not seen a drop off in available power even after running the stage for a full 6 hour show."